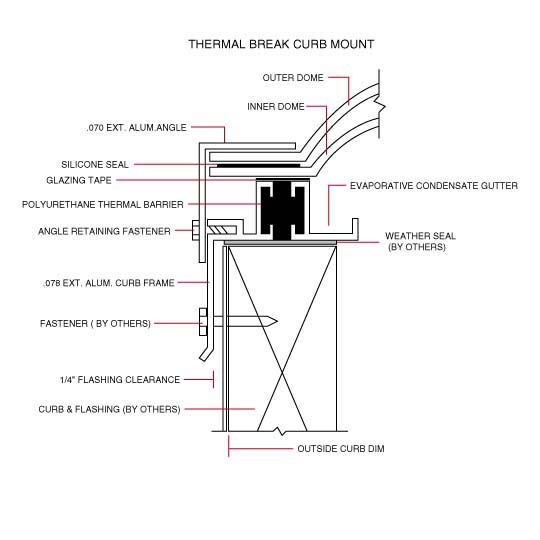 Thermal Break Curb Mount plastic domed or pyramid style units are available in acrylic or polycarbonate plastic. Reference our technical data page for glazing data. Add letter P after TBCM for pyramid style units. Plastic (Dome or Pyramid) skylights shall be Birdview’s Thermally Broken Curb Mount Model (TBCMG) (size) as manufactured by Birdview Skylights, 201Longhorn Road, Fort Worth, Texas 76179. The skylights shall be factory assembled unit(s), each consisting of sealed (acrylic or polycarbonate) __________ (domes or pyramids) __________ made from Birdview’s (tint) __________ to support 40 PSF live load, with a .078 extruded aluminum frame with polyurethane thermal break to prevent condensation on interior portions of aluminum frame and .070 glazing retaining angle. Each unit will have evaporative condensate gutter, with no weep holes, to prevent air infiltration or exfiltration. Glazing materials are not designed to support the weight of a person.